In the main article about the road to Diaspora, we looked at setting up our own pod to interact with the Diaspora federated community. Now we’re going to look at how that actually works. Or not. Because since I set up my pod a few weeks ago, I’ve had nothing but problems. To give you an idea of how bad Diaspora is, even after a couple years of development, look no further than the bug tracker on their Github project page. After a week of using my pod, I had already posted half a dozen issues – and that’s for just one user on a lonely pod. I wasn’t following a lot of people either. Some of those issues have been closed, some are still open. But the point is: this is not good for a project that’s been in beta testing for so long. Then, there’s the performance issues. Ruby on Rails has never had a very good reputation in this department, but I thought it was mostly a “_haters gonna hate_” kind of reputation, or some remnant of the framework’s early days, when it was not necessarily very optimized. 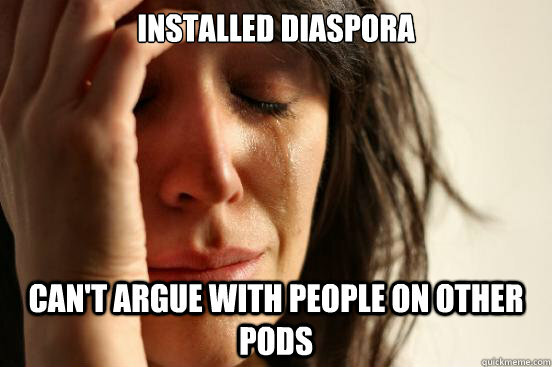 But after running Diaspora, I’m revisiting my opinon. On an Ubuntu VM with 512Mb RAM, the thin server that runs Diaspora is the only process that ever got killed for running out of memory – neither Wordpress or MediaWiki or anything else ran into this situation. And that happens on a regular basis. We’re talking a couple times a day on average. And don’t even think of running a Rails console at the same time: it may work for a while, but you better get done quickly because one of the 2 processes will die soon enough. And then there’s the whole “federation” aspect, which is the whole point of Diaspora. Spoiler warning: it doesn’t work. I don’t know if it’s related to the performance problems above (the process could be dropping important bits of information when it gets killed) but I always seem to be missing posts and updates from anybody else that’s not on my pod. Doing some testing between my pod and a few other well-known pods like joindiaspora.com or diasp.org, I get completely random results: sometimes a comment or “like” gets propagated in a few seconds, sometimes it takes hours, and sometimes it just doesn’t show up at all on one end or another. I could go on and on about all kinds of little problems, from the completely stupid “_PersonName started sharing with you!_” email that doesn’t make any sense (because it means they’re following you, which means they won’t share anything with you unless you follow them back) to some weird design decisions around hashtags (try figuring out how to follow hashtags from other pods) to some obvious problems that never seem to get fixed (like useless Diaspora links to your Twitter cross-posts, or the inability to cross-post public posts to Facebook). I guess that’s what the Github bug tracker is for but, again, this really doesn’t look like a project that’s more that 2 years old. The original Diaspora founders recently left the project, saying they’re “_giving it back to the community_” while they “_take the back seat_”, a.k.a. Makr.io, a very stupid website concept. Some people say that’s the death of Diaspora, but judging from the state of it, it may actually be what saves it. The project was obviously badly managed and designed from the start, so maybe, just maybe, having a community of better programmers take over the codebase would make it viable. There’s also the very, very slim possibility of someone either re-implementing Diaspora using a different framework than Ruby on Rails. Diaspora is mostly based on open standards – although the keyword here is “_mostly_” – so it would be possible to rewrite something from scratch that’s compatible. Friendica WORKS today (unlike similar projects which are still struggling at basic communications after two years, and after squandering huge amounts of money). Seeing how Friendica works and is easily installed – even though it’s ugly and useless to me – Project Red could be a good thing if it’s based on asymmetric relationships and Mike can enlist the help of a moderately talented web designer. In the meantime, I don’t think we’ll get people away from Twitter and Facebook any time soon.